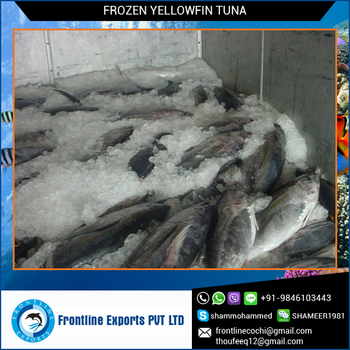 Frozen Yellowfin Tuna is commonly treated with carbon monoxide or tasteless smoke to prevent the red color of the fish from going brown. If abused, carbon monoxide can be used to enhance the color of lower grade yellowfin. However, fresh yellowfin loins and steaks are rarely treated with carbon monoxide to maintain color. Additionally, the quality of pole and handline-caught yellowfin can suffer because the fish can "burn" themselves when they struggle as they are landed and will result in the fish having a very short shelf life. 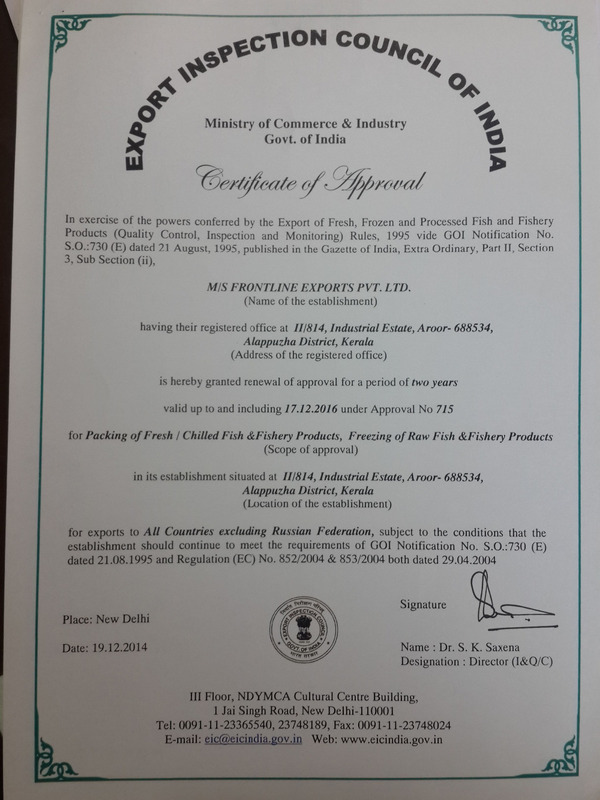 Frontline Exports is one of the leading processor and exporter of frozen seafood products located in Cochin,Kerala ,India. Frontline has strong management team and well trained, skilful and professional staff with vast experience in seafood processing and management. Our "Ocean Queen " brand has been recognized as a Quality Product by its customers across the world. With a HACCP approved manufacturing program, we are ready to meet the requirements of quality- conscious markets worldwide. The company specializes in raw material procurement, processing and export of frozen seafood as well as fresh chilled fishes. We specialize in all sorts of seafood, including fish fillets, Chilled Seafoods, octopus, peeled shrimp, cut crab . We deal in all Sea foods available in Indian Ocean (FAO Area 51). Some of our major products are as follows- Lizard Fish, Indian Mackerel, Hours Mackerel, Spanish Mackerel, Barracuda, Ribbon Fish, Skip Jack Tuna, Yellow Fin Tuna, Little Tunny, Big Eye Tuna, Cat Fish, Squid, Cuttlefish, Octopus, Shrimps, Crabs, Seer Fish, Grouper, Snapper, Indian Oil Sardine, Mahi Mahi, Catla, Bully Eye, Silver Sillago, Mullets, Pearl Spot, Japanese Threadfin Bream, Tilapia, Sole Fish, White Bite, Trevally, Reef Cod, Snapper, Pomfret, Ray, Yellow Clam etc. 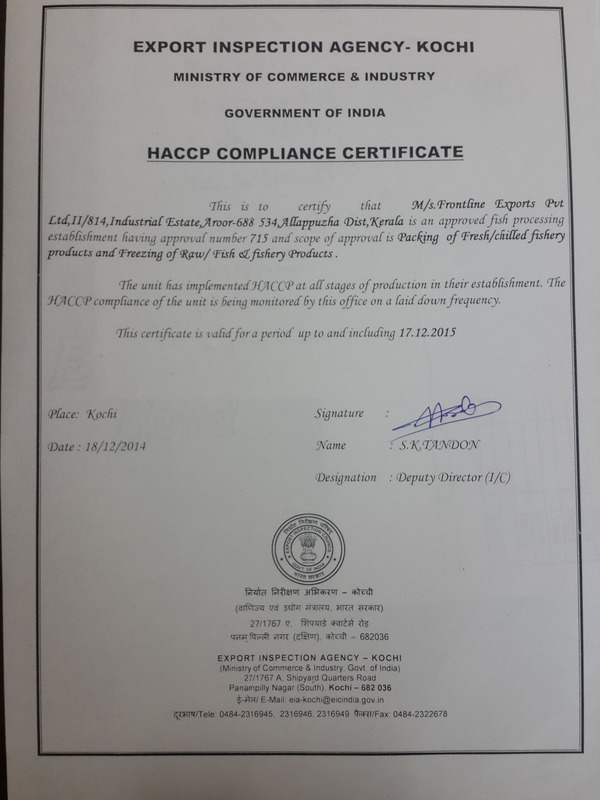 All our aquatic products are processed under Quality Authentication System of HACCP and are well exported to EU and Non EU Countries like China / Korea / Egypt / Hong Kong / Tunisia / Middle East / Europe /USA / Indonesia,/ Philippines/ alaysia/Thailand/Vietnam/Japan /Korea /Egypt /Russia, and so on. Our company takes "superior quality, reasonable price, people-oriented and sincere service" as the business philosophy. "Excellent processing technique, strict quality management" is our faith that will never be changed. We stand behind what we make and offer a 100% quality guarantee. If any aspect of your order doesn't meet your expectations, we'll responsible that . We respond to your requests within 24 hours.Sincerely welcome your kind contact and visitation for further negotiation on mutual benefits! Two stainless steel 60 minutes plate freezers-capacity - 20 MT/day . Three air blast freezers-capacity – 20 MT/day. In-house waste water treatment plant-approved by Pollution Control Board. 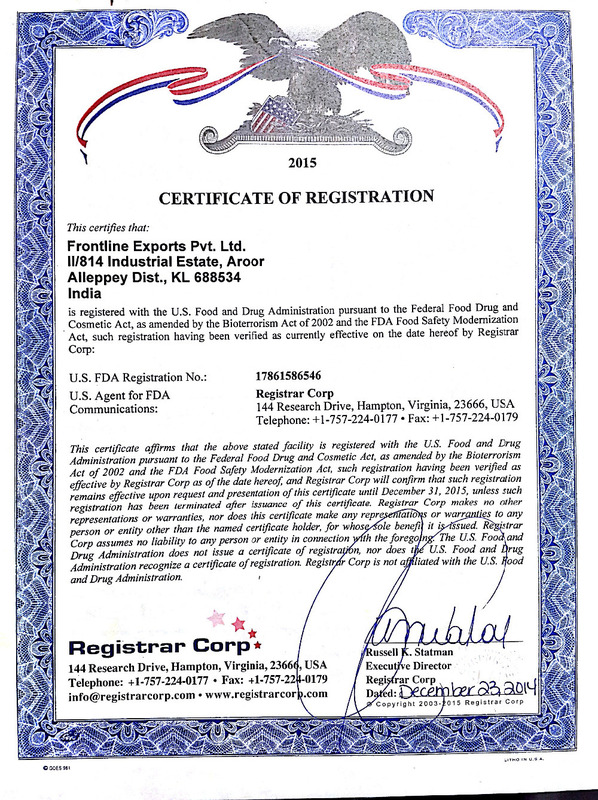 In house pre-processing plant, and additional pre-processing plant both approved by Export Inspection Council. We have a well maintained in house pre-processing facility in our company. The pre-processing facility is integrated with processing section. The processing facility is integrated with the Pre-Processing section. Hence good quality is always maintained. The freezing arrangement is also integrated with processing section. There are two different units of contact plate freezers with capacity of 20 MT in 60 minutes, three airblast freezers of 7 MT each. The frozen cold storage is also integrated with the freezing section and the one cold stores operate with a capacity of 360 MT. We have at their disposal one flake ice machines with a capacity of 20 MT per day. We strictly follows the treated ground water used for processing and ice manufacturing. The factory has got 1.5 lakh litres capacity per day and the quality of water and ice are consistently tested by the Central Institute of Fisheries technology, Government of India. Besides our own quality control lab tests the water once in every 10 days and proper records are maintained. The shipment to various countries is being done by In House Container Stuffing. We have has enough plugging facilities to maintain the temperature of the container steadily. The close proximity of Cochin port - just 5 kms from the factory is a major advantage.